We are proud to offer The Jake Belt. It is what I consider one of the finest hand made gun belts in the USA. The best holster is made even better by a quality belt designed for the carry of a firearm. Ordinary single layer belts tend to sag under the weight of a holster…..Our belts are 1.5 inches wide made of two layers of top grain leather. These two layers are glued and stitched with a heavy nylon thread for added durability, secured with Chicago screws and a heavy duty roller buckle. The result is close to a ¼" thick belt, offering superior support for your holster, while maintaining the flexibility you want for a lifetime of comfortable, rugged, working usability; that looks great with any business attire. The roller buckle can be removed to add a custom buckle. Contact us if you would like a custom width belt. To order, please measure a belt (that fits you) from the turnback end (where the leather folds over the buckle) to the hole in the other end of the belt that you use. (*Please do this with a belt that you currently use! Add 2 inches if you're not measuring a Carry Belt.) Just telling us your waist size WILL result in a belt that does not fit properly, so please use the link below for directions about choosing the correct size belt. An easy way to get the RIGHT SIZE GUN BELT is to add 4" to the pant size you wear. Example if you wear size 36 Pants you would order a size 40 gun belt. 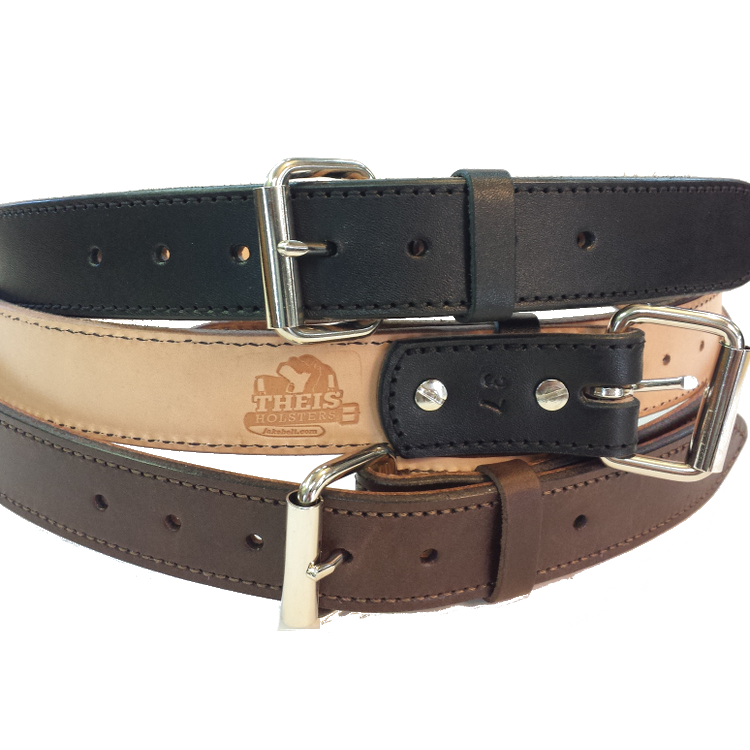 Belts sent back for exchange due to customer sizing errors will incur a $10.00 exchange fee. If you find that you simply don't like the belt, return it within the first 2 weeks and I refund your purchase price. Our belts come with a full one year warranty against manufacturer defects.